Went I first entered 0705 I thought these were the living quarters of some construction workers. Then I discover they were classrooms. 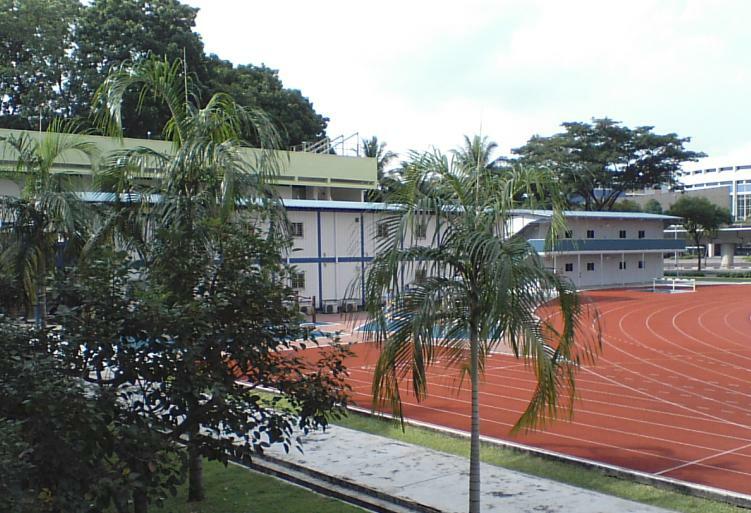 When I look at the students' handbook, I discover that these were actually permanent classroom blocks, refered to as "Block 4". Tell me how many schools are using containers similar to construction workers' living quarters as permanent classrooms? Most amusing sometimes when I drop by a blog and notice that the good'o container blocks of almost more than a decade ago are still around. I graduted in 1999, and I swear that I cannot remember alot of things about AJC except for the container block, even though that was one of the schools that I thoroughly enjoyed during my entire academic life. Hey I have been there and done that and I am so glad I came to this blog, and better still when you brought in a nice camera phone or sorts that took some pictures that allowed me to have an impression of a memories that have since faded - it feels like yesterday - you see it's like a castle siege, when I was in the school compound surrounded by barb wire I thought of getting out of that sh*t place and just do something else and here and now a decade down the road I just wonder why is it so difficult to get pass the security guard just to see the school compound that I once was a student of.. Non Mihi Solum, thanks for living my legacy.. I probably didn't drop by for moments of sentimental compassion or nostalgia sharing, probably gonna check out Broadway Plaza and Blk 712 AMK for what they've got..
0705 is consistently ranked 6th!